Best Fantasy and Science Fiction: Sad Autobot: Transformers FAIL? 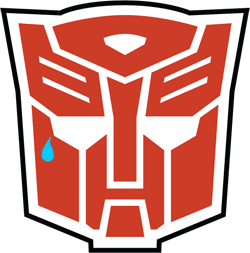 Quite a sad Autobot...I found this while browsing Tor.com this evening. The article I was viewing is all about how the Transformers movies should have been done and how they more resemble GoBots than anything related to Transformers. Quite an interesting read. I haven't heard anything good about the new Transformers movie yet, mostly bad things such as how it's too long and that the first one was much better. Have you seen it? What do you think? Funny, I walked away thinking the opening and climax scenes were about twice as long as necessary and the first movie was much better. The comparison with GoBots cracks me up. This was a comic made live action. We aren't talking great Expectations. It's supposed to be light on theme and highbrow content. I thought it was good. Almost all critics hate main stream movies, especially summer block busters, so I would not base any opinions on what "they" say. Lots of good action and one liners, and was a fun time over all!